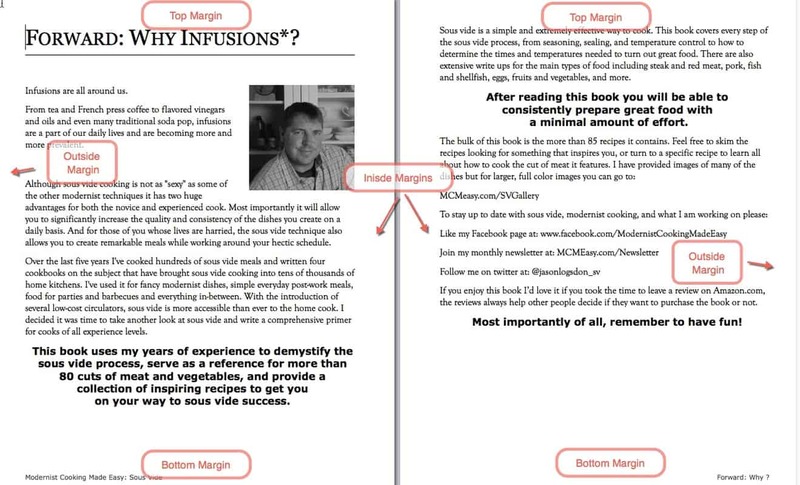 Margins are the area between the edges of the pages and where the text or images start. For books, you'll want to choose "Facing Pages" because the pages will be displayed facing each other, as opposed to if you just printed out the pages and stapled them together. Selecting this changes the options for margins to Inside, Outside, Top, and Bottom. If you open a book on your desk and look at it, the Top and Bottom are the usual margins at the top and bottom of the pages. Inside is the margins on the inside of the book, where the pages are attached to each other. Outside is the margins on the left and right border of the book. Diagram of where page margins are referring to. For my books I tend to use 0.75" for the inside margin, 0.5" for the outside margin, 0.5" for the top, and 0.4" for the bottom. The inside margin usually has some minimums depending on the number of pages - 0.375" for up to 150 pages, 0.5" for up to 300 pages - but I like the larger margin for my books so the text doesn't sink into the crevice. The top, bottom, and outside margins generally have to be larger than 0.25" and 0.5" is often recommended.